Protecting the Commander-In-Chief of the relatively young Continental Army was the special duty of a small, carefully selected body of infantry and cavalry. 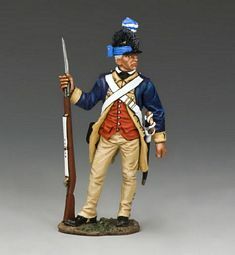 In March 1776 it was decided that a reinforced company of soldiers should be formed to guard the headquarters and person of General Washington himself. These men were to be recruited from a cross-section of the best-trained and disciplined infantrymen and troopers of the Continental Army. Each recruit had to be American-born and at least 5’9” tall! He also must be of "good-character” and have a "soldierly-bearing”. Once a recruit was accepted he received a brand-new uniform of a dark blue coat with buff facings…a handsome red waistcoat…all topped off with a dragoon-type cap with a blue and white feather plume on the side…Quite a "dandy”. But these "Dandies” could fight also and Washington ensured that they were not only a "guard” unit…They saw a fair bit of action too!